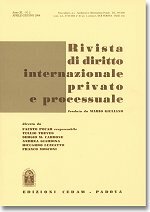 The third issue of 2015 of the Rivista di diritto internazionale privato e processuale (RDIPP, published by CEDAM) was just released. It features one article and two comments. In his article Reiner Hausmann, Professor at the University of Konstanz, examines general issues of private international law in a European Union perspective addressing, i.a., connecting factors and the questions of characterization and interpretation, in “Le questioni generali nel diritto internazionale privato europeo” (General Issues in European Private International Law; in Italian). This article tackles general issues in European private international law, and namely issues of connecting factors, characterization and renvoi, to portray, on the one hand, how and in which direction this area of the law has emancipated from the domestic legal systems of the EU Member States and to illustrate, on the other hand, which are the underlying principles that encouraged and made this transformation possible. As far as connecting factors are concerned, the paper shows that the recent development in European private international law – as opposed to the solution in force in many Member States – is characterized by (i) an extension of party autonomy to family and succession law; (ii) a systematic substitution of nationality with habitual residence as the primary objective connecting factor in international family and succession law, and (iii) the promotion of lex fori as objective and subjective connecting factor, in particular in cross-border divorce and succession law. Therefore, the primary objective of the European legislation in the field of private international law is not to identify the closest factual connecting element of a case to the law of a certain country but, rather, to accelerate and improve the legal protection of European citizens and to reduce the costs in cross-border disputes by allowing parties and courts to opt for the lex fori and thus to avoid, to a large extent, the application of foreign law. Moreover, the paper illustrates that while the introduction of renvoi into European private international law by means of Article 34 of the Regulation on cross-border successions appears to be in conflict with the principle of unity of the succession, which is a main pillar of the Regulation itself, the practical importance of renvoi is limited, because renvoi is mainly restricted to cases where the deceased had his last habitual residence in a third State and left property in a Member State. As suggested in the paper, in order to avoid difficult problems of characterization when marriage ends by the death of one of the spouses, it would appear sensible to follow the example of Article 34 of the Succession Regulation in the forthcoming EU regulation on matrimonial property. Arianna Vettorel, Research fellow at the University of Padua, discusses recent developments in international surrogacy in “International Surrogacy Arrangements: Recent Developments and Ongoing Problems” (in English). This article analyses problems occurring in cross-border surrogacy, with a particular focus on problems associated with the recognition of the civil status of children legally born abroad through this procreative technique. The legal parentage between the child and his or her intended parents is indeed usually not recognized in States that do not permit surrogacy because of public policy considerations. This issue has been recently addressed by the European Court of Human Rights on the basis of Article 8 of the ECHR and in light of the child’s best interests. Following these judgments, however, some questions are still open. Cinzia Peraro, PhD candidate at the University of Verona, tackles the issues stemming from the kafalah in cross-border settings in “Il riconoscimento degli effetti della kafalah: una questione non ancora risolta” (Recognition of the Effects of the Kafalah: A Live Issue; in Italian). The issue of recognition in the Italian legal system of kafalah, the instrument used in Islamic countries to take care of abandoned children or children living in poverty, has been addressed by the Italian courts in relation to the right of family reunification and adoption. The aim of this paper is to analyse judgment No 226 of the Juvenile Court of Brescia, which in 2013 rejected a request to adopt a Moroccan child, made by Italian spouses, on the grounds that the Islamic means of protection of children is incompatible with the Italian rules. The judges followed judgment No 21108 of the Italian Supreme Court, issued that same year. However, the ratification of the 1996 Hague Convention on parental responsibility and measures to protect minors, which specifically mentions kafalah as one of the instruments for the protection of minors, may involve an adjustment of our legislation. A bill submitted to the Italian Parliament in June 2014 was going in this direction, defining kafalah as “custody or legal assistance of a child”. However, in light of the delicate question of compatibility between the Italian legal system and kafalah, the Senate decided to meditate further on how to implement kafalah in Italian law. Therefore, all rules on the implementation of kafalah have been separated from ratification of the Hague Convention and have been included in a new bill.